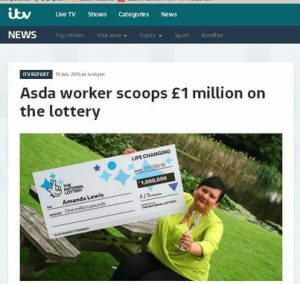 Asda worker Amanda Lewis got lucky in a previous draw and decided to use part of her £2.60 in credit to purchase a lucky dip. Having done the same countless times, she promptly forgot about it; but this time the results were very different! Next day she checked the ticket and found no matches. Good thing she asked a lady at the lottery kiosk to double check. She became nervous when the lady started smiling broadly – she had won a million pound in the millionaire raffle draw. Her plans include buying cars for two children, and going on a vacation trip. Then she’ll decide what to do with the rest of the money with her husband.